Blast off into the final frontier with your favorite avian avengers! The Angry Birds are back, and this time even the Earth can't contain their fury. Blast off into the final frontier with your favorite avian avengers! 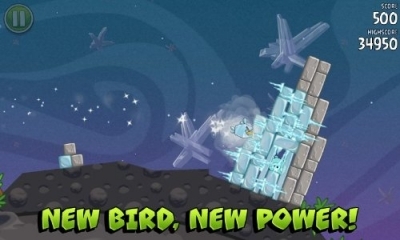 The Angry Birds are back, and this time even the Earth can’t contain their fury. 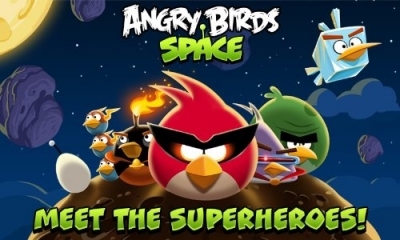 Angry Birds Space, the all-new adventure from Rovio, takes you to straight to the cosmos, where the feathers continue to fly. 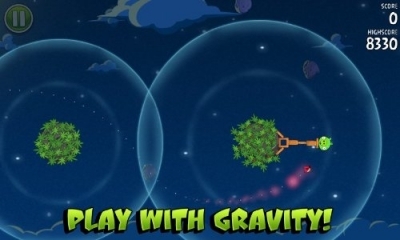 This time, the familiar physics-based gameplay of the original Angry Birds games comes with a NASA-style twist: the birds’ slingshot trajectories are affected by different gravitational fields as they navigate planets, black holes, stars, and more. 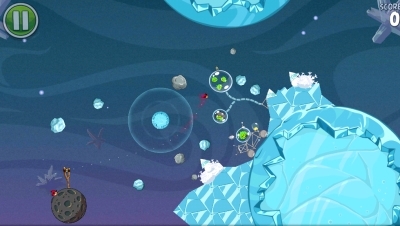 Angry Birds Space features 60 interstellar levels on celestial bodies and in zero gravity, resulting in spectacular gameplay ranging from slow-motion puzzles to lightspeed destruction. With regular free updates, brand-new birds, brand-new superpowers, and a whole galaxy to explore, the sky is no longer the limit! 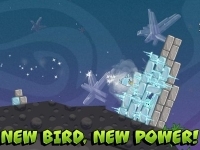 The Angry Birds have achieved a lot in the last two years, but apparently peace on Earth wasn’t good enough. 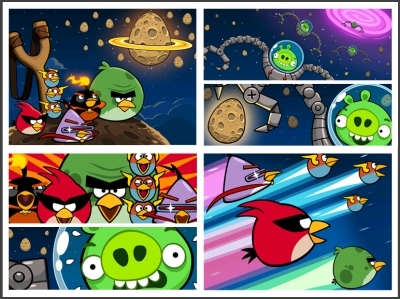 The evil pigs have taken the fight to outer space, and the Angry Birds are right on their curly tails. After a giant claw kidnaps their eggs, the Angry Birds chase it into a wormhole and find themselves floating in a strange new galaxy–surrounded by space pigs. 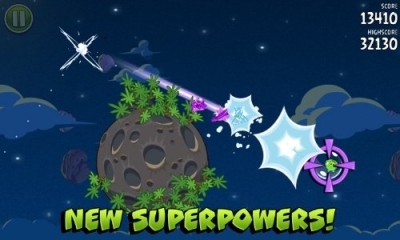 Luckily for our feathered friends, a funny thing happened when the Angry Birds passed through this cosmic portal: they emerged with amazing super powers of their own. Now the birds and pigs are locked in a fierce intergalactic battle, fighting on and above rocky asteroids, icy planets, forbidding black holes, and much more. 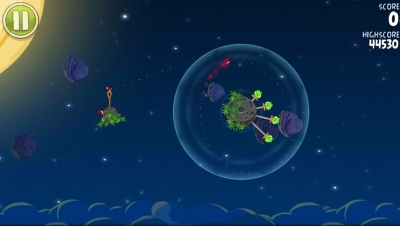 The Angry Birds have brought along their handy, enormous slingshot, of course; but the outer-space environment creates new, unpredictable flight conditions. No longer can they just rear back, fire, and hope for the best. 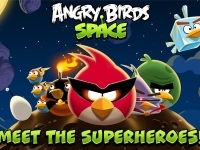 As with previous Angry Birds games, Angry Birds Space offers a plethora of cool bonus content waiting to be unlocked. 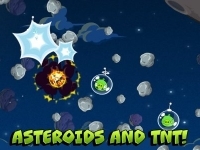 Here, as you unlock shiny Eggsteroids, you’ll find bonus levels that pay homage to classic video games of the past. Play hard, unlock new levels, and see what delightful interpretations of well-known video games await. 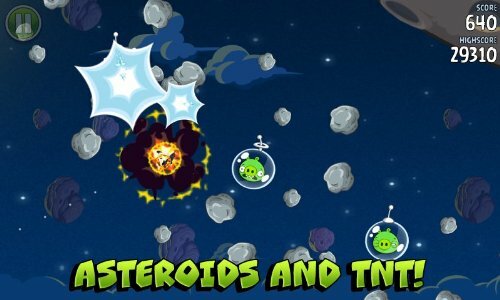 All of them integrate Angry Birds characters into the gameplay, of course, for a surprising and fun fusion of old-school and new-generation gaming!